An online Display Screen Equipment Training Course from just £4.99. This online training course covers DSE – the Display Screen Equipment Regulations 1992 and shows users how to set up and use a workstation correctly. 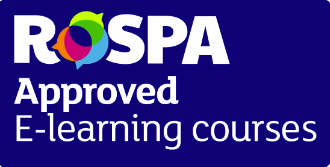 The qualification is a national health and safety training certificate that is recognised by local authorities and corporate employers throughout the UK. As well as your certificate of achievement, why not download our free DSE Poster HERE to use and display at your workplace? Why choose our award winning online display screen equipment course for your training? Because this course teaches you about good posture which increases work station pleasure and helps prevent strains and injuries. Here's some more great news about our display screen equipment course. The course usually takes about an hour, depending on your learning speed. Is this DSE course for you? Do you work at a desk or workstation and sit in the same position for long periods of time? Do you use a mouse, roller ball, keyboard and display screen? If you answer 'yes' to either of the above then this course is for you. Do you know the correct posture techniques and good working practices to prevent RSIs, neck, back or limb complaints? Do you know the correct set up of chairs, armrests, seat heights and display screen distances to create an ergonomically suitable working environment? If you answer 'no' to either of the above then this course is for you. The Aims of this display screen equipment course. To give employees the knowledge about good workstation set up which promotes reduced stress and fatigue as well as counter acting many common ailments that a poor workstation set up may cause. To promote workplace wellbeing by teaching good posture and best practice principles. To help combat musculoskeletal disorders, reduced concentration levels, headaches, eye fatigue and other symptoms that are often the result of using a poorly designed workstation. To learn what DSE and the DSE regulations are. To learn about ergonomically designed equipment and its importance. To learn about cognitive ergonomics which is concerned with mental processes, such as perception, memory and reasoning. To learn that organisational ergonomics are about how to make things work well for and within an organisation. Policies, teamwork, deadlines and productivity targets. Creating easy systems of work for an organisation as a whole and not the individual. Your DSE training certificate is valid for three years.